Outdoor furniture is by Kingsley Bates. “It’s so beautiful to watch the leaves change through the seasons,” says homeowner Amy Harrison. The wall of metal windows and doors is a major swoon-worthy element, particularly with beautiful trees beyond the view. 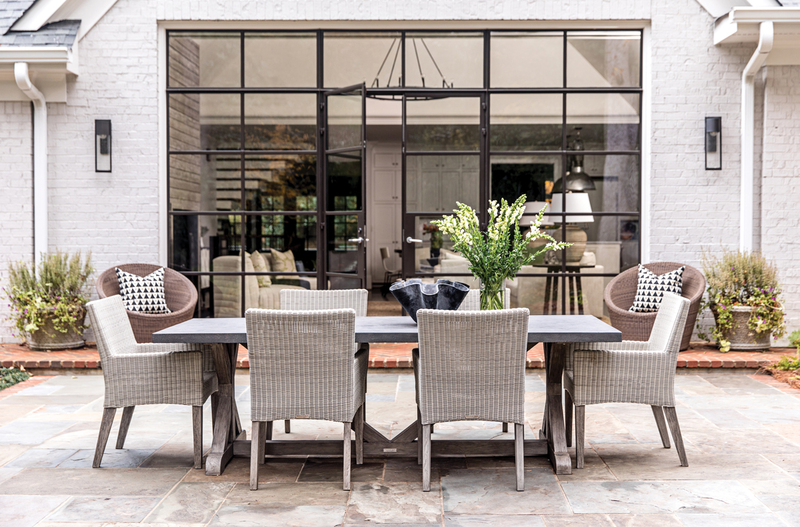 “I will never be tired of iron windows or doors,” says Anna Wooten. “They’re a take on old classic iron windows, and I love how they have such a presence in new homes now. I feel like they’re a ‘trendy’ thing that will stick around.” The sofa and coffee table are from South of Market. An abstract painting by Mary Beth Cornelius from Muse & Company brings in colors of outdoors. A previous owner had remodeled the kitchen and bathrooms, so the budget could be used for decorative updates rather than demolition. 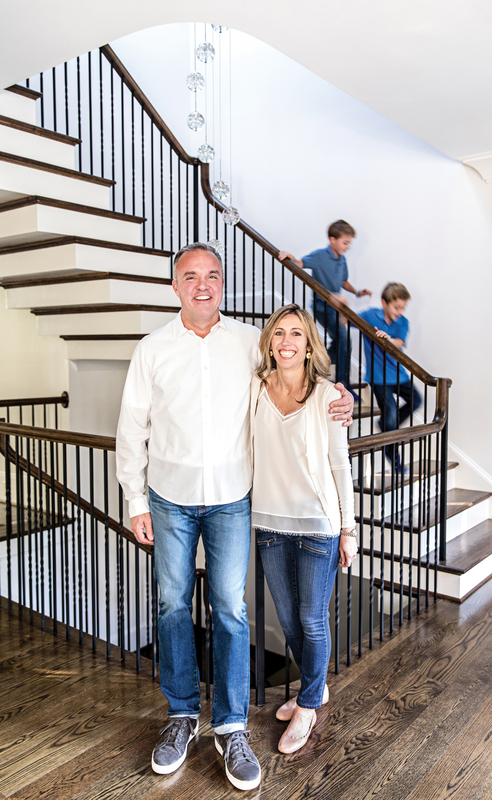 “Because of the very open design of our home, you really have one contiguous entertainment space right from the front door to the back of the living room,” Jay says. 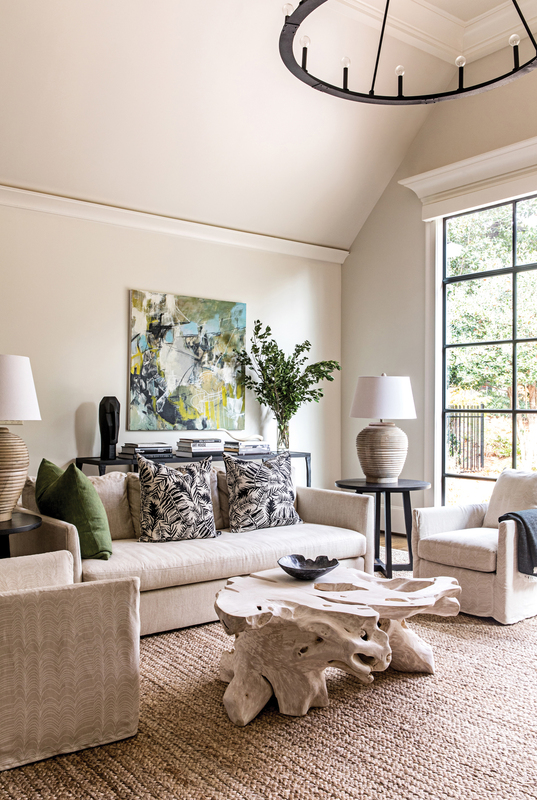 “Folks are blown away by the large metal window and doors in the back of the living room.” Since this dramatic, 10-foot-high wall of glass is seen from the front door, Anna Wooten kept the first floor monochromatic and understated, preferring to update with paint, lighting, and furnishings rather than with pattern. 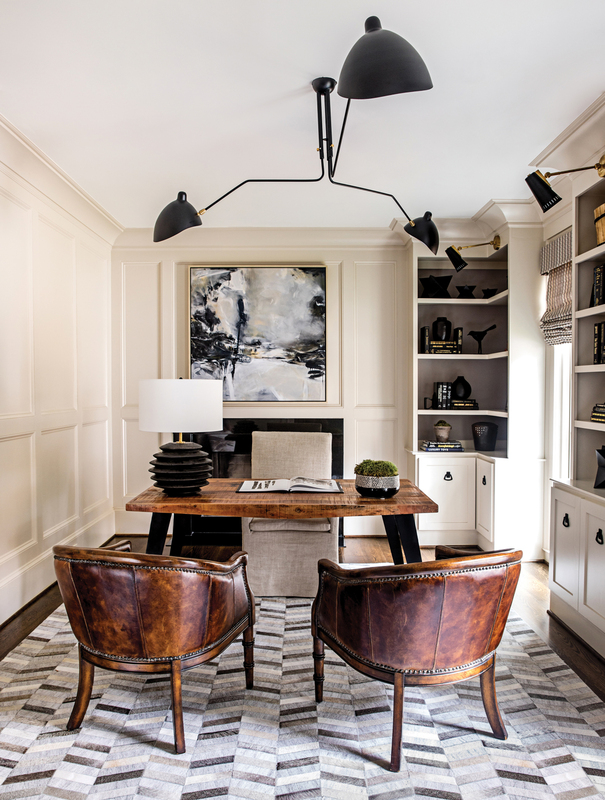 “I was able to use so much black in here because of the natural light, which is key to a black room,” says interior designer Anna Wooten Loggins. The light fixture and table are from South of Market. Large-scale black-and-white botanicals are from Westside Market. 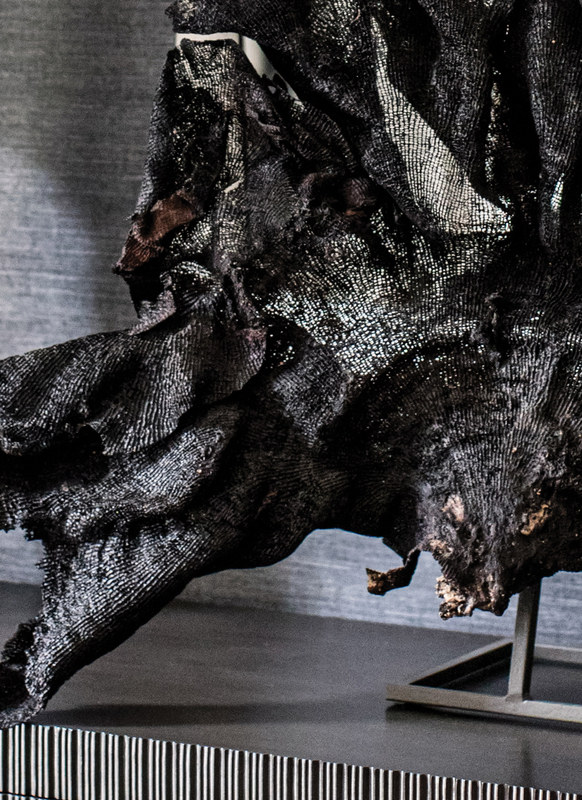 The black gauzy sculpture is from B.D. Jeffries. An elegant hide rug contributes to the gray and white tones in the office. Light fixtures from Circa Lighting add a contemporary edge. The rustic wood covering the fireplace references the wooded backyard. 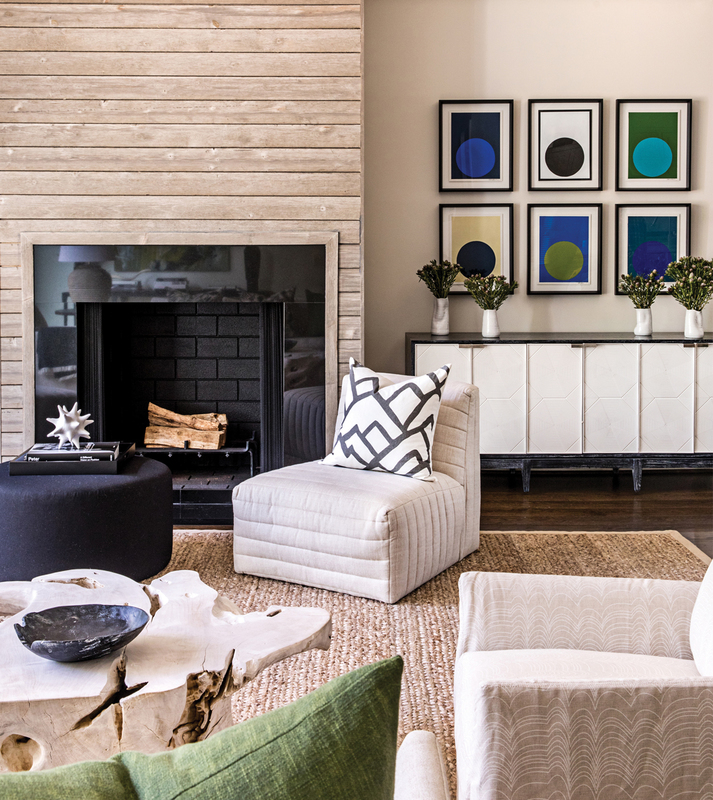 Amy loves the streamlined sideboards and art, calling the look “sort of rock ’n’ roll,” but with comfortable seating for the family. The artwork is “Dots” by Stephanie Henderson through Gregg Irby Gallery. The designer also went large for impact. Rustic wood now covers the fireplace from floor to ceiling and counterbalances the tall windows. Big-scale lights, like a dazzling black chandelier in the dining room and a duo of pendants in the kitchen, bring in a modern touch and create new focal points. The Harrisons’ old-fashioned furniture—mostly dark woods like cherry and maple—didn’t make the cut with the new-fashioned look. Streamlined new furnishings in grays, creams, and blacks are comfortable, kid-friendly (the pair have two children), and low-key enough to allow statement pieces to shine. Classic window treatments in the master bedroom wear the house colors of cream and black. The wood and woven bed is by Bernhardt. Anna Wooten updated the bathroom with new Roman shades sporting a graphic pattern. Anna Wooten also played with a black-white dynamic throughout the house. “Black is my favorite color, even though most people don’t find it a very happy color,” she says. “I’m a big fan of adding it to projects wherever I can.” A grass cloth wallcovering in her preferred color covers the dining room right off the foyer, looking all the more dramatic alongside white trim and lighter draperies. She continued adding black touches throughout the house to make it feel balanced and modern but not overbearing: a custom black ottoman and black print botanical pillows on the sofa in the living room, black side tables and trim on window treatments in the master bedroom. Interior design Anna Wooten Loggins, A. Wooten Interiors, awooteninteriors.com. Dining room Light fixture and table: South of Market, southofmarket.biz. Console: Noir, noirfurniturela.com. Large sculpture on console: B.D. Jeffries, bdjeffries.com. Office Light fixtures: Circa Lighting, circalighting.com. Living room Circle art: “Dots” by Stephanie Henderson through Gregg Irby Gallery, greggirbygallery.com. Verellen sofa, armless chairs, and coffee table: South of Market. Fabric on swivel chairs: F. Schumacher, fschumacher.com. Fabric on sofa pillows: Bradley, bradley-usa.com. Pair of side tables: TritterFeefer, tritterfeefer.com. Abstract painting: Mary Beth Cornelius, Muse and Co. Fine Art, musecofineart.com. Patio Chairs and table: Kingsley Bate, kingsleybate.com. Master Bedroom Bed: Bernhardt, bernhardt.com. Fabric on bed pillows: F. Schumacher. Side tables: Noir. Lamps: Currey and Company, curreycodealers.com. Chandelier: Circa Lighting.